More friends and a blog: What a scent. And you know you can eat them, too, right? Have you tasted those? They're delicous! I have pink and white ones, too. Gasp! My heart almost stopped when I saw this picture. Check my blog entry for the 18th and you'll see why! So what ARE these things? 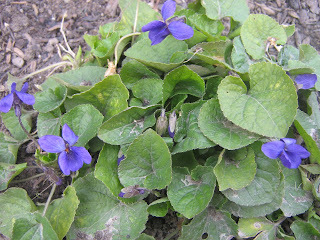 I called them toothed violets. I agree, they ARE tenacious. I love them. Yes, Andrea, we have eaten them. E is in training to be the next Euell Gibbons , so it is my job to make sure I inform him of any plant that is considered edible - whether it tastes good or not. Are the pink and white ones edible?